By pressing Ctrl-F (Windows) or Cmd-F (Mac), the find bar appears at the bottom of the Mozilla Firefox window. On Windows XP, pressing forward slash (/) also works. I use it a lot to find a certain phrase or word in a page, but one thing that really annoys me is the sound, if you can call it a sound that's played when the phrase is not found in the page by Firefox. If you, like me, ever have typed an URL (address) when the focus was not on the address bar of Firefox but on the page self and was greeted by a farting Firefox, you know what I mean. Luckily, the sound can be turned off (or changed). 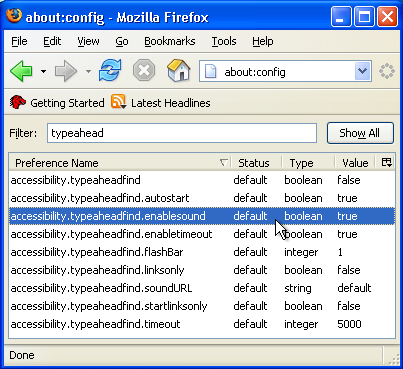 Type about:config in the address bar, and enter typeahead in the filter. Now only the configuration options for the typeahead find should be visible, especially the accessibility.typeaheadfind.enablesound option. Just double click on this entry to turn the sound off. The line should turn bold to reflect that the settings is no longer the default one, and the value should be set to false. Note that you have to restart the browser for the change to take effect. on Windows XP. With this setting you also have to restart the Firefox browser for the change to take effect. Note that you always can fall back to the default value by selecting an entry, pressing the right mouse (menu) button, and selecting the Reset option.